Steering Captain through a sea of sand, a Vale, South Dakota cowgirl sailed around the barrels faster than all the rest. Kristi Steffes and her horse Captain captured the 68th annual 2016 College National Finals Rodeo Association championship during the finals in Casper, Wyoming, June 10-18. Kristi made her fastest run during the final performance, clocking in at 13.85 and turned in a total time of 56.09 after four days. Her win added the sixth national championship title to BHSU’s rodeo team. Glen Lammers, head coach for the Yellow Jackets and Great Plains Region Coach of the Year, credited Kristi’s humilty and positive attitude for her success in the arena. “She is great kid with a great knowledge base. She’s open to ideas and I’ve tried to help her with little things. She deserves to finish her senior year this way.” Her points helped place the BHSU women’s team in third in the nation and first in the Great Plains Region. For the first time in BHSU history, both the women’s and men’s teams finished in first place in the Great Plains Region in the same season. Steffes has a special bond with the home-raised horse that carried her to victory. Captain has been with her for fifteen years. “Captain gets kind of nervous up the alleyway and Kristi stayed calm. Her calm demeanor helped her horse,” said Lammers. Kristi advises others with rodeo goals to spend quality time with their horses. “Believe in yourself and don’t give up. Bond with them (your horses).” Kristi is working with younger horses but still turns to Captain often. Captain is out of a family-owned mare, Mitos Silver Bell (Ruby) and sired by Frenchmans Guy. Kristi’s sister, Nikki, ran barrels on Ruby, winning many Little Britches, high school and college rodeos on her. 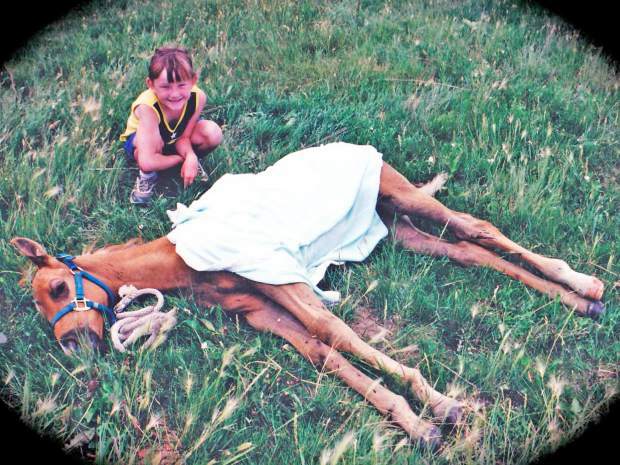 The mare was named National High School Rodeo Association’s Horse of the Year in 2003. While growing up in Vale, South Dakota, Kristi practiced riding in and outside the arena at her home. Her mother grew up around horses and her father was a bull rider. Kristi has been invited to compete in the Cinch Rodeo Shootout at Cheyenne Frontier Days next month. She’ll spend her summer traveling the pro circuit rodeos in Casper, Sheridan and Cheyenne to name a few.